Knife the character door located under the stairs to the lighthouse just below PHD flopper. Put the fuse inside the fusebox next to the Character room. Use explosives to blow up 4 generators glowing red around the map. · Outside the map on the pathway between the broken end of the boat and spawn. Return to the character door and knife until the dialog is over. · By the first half of the ship going to the second half of the ship. Note: Have one player knife the vodka while another stands under it. Return to the character door and place the vodka bottle in the pneumatic tube. Note the dials and Morse code can be done in any order. There is a dial on each level of the light house, the code being 2746 from top to bottom. The dials are the same color in the same level of the lighthouse every game. The colors of the dials from top to bottom are Yellow, Orange, Blue, and Purple. · Turn the purple dial until it is at the correct number (being 6). · The bottom 3 numbers should now be at the correct order being 746 from top to bottom. · Turn the purple dial the same number of times as the yellow dial was previously turned (the number of times you counted). · Turn the blue dial until it is back at the correct number (being 6). Four Morse code radios must be activated in the correct order. · The radio under the power room, on top of a cabinet on the right side. · The radio located next to Stamin-Up, on top of the barrel. · The radio near the back of the second ship, where the player can buy Semtex grenades. It is inside the train cart next to a window on the right-hand side. After the radios are activated in the correct order go to the control room and turn the steering wheel to 5 o’clock. Push the 1st lever once and the third one 3 times. Activate the fog horns in the correct order. · At the base of the lighthouse, next to the pool of water. · After the slide to Speed Cola, around the right side of the corner in the water. · At the base of the lighthouse, on the left-hand side next to the building. · After the slide to Speed Cola, behind the huge rock in the center. Acquire VR-11 from the box. 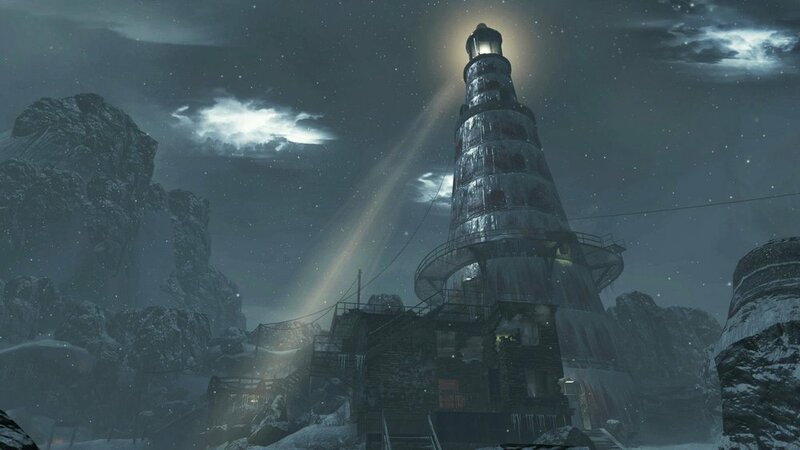 Then take a zombie to the base of the lighthouse where a green light should be shining down. Shoot the zombie with the VR-11 to change it into a person. He will float up into the green light. Before he reaches the top you need to shoot him with weapons until he is in the downed position not moving. The golden rod will come down the green light and land at the bottom of the lighthouse. Take the golden rod to the character room and insert it into the pneumatic tube. Knife the fuse box when the fuse sparks to end the easter egg.